A good night’s sleep has traditionally been touted as beneficial – but you may want to set your alarm an hour early tomorrow. 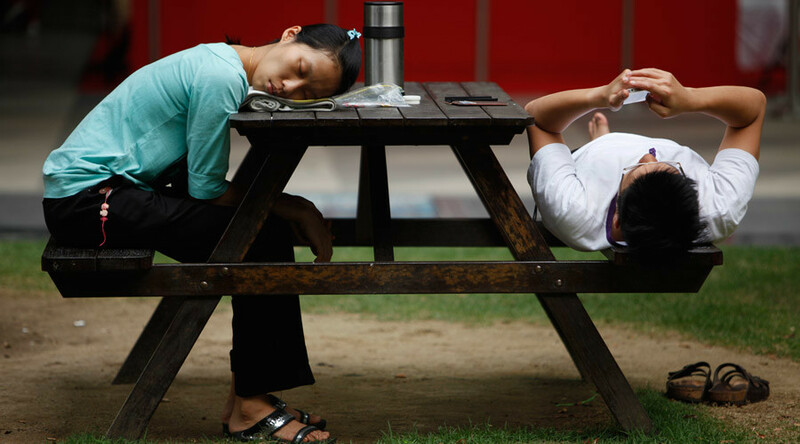 A new study says that longer sleeping times combined with sitting for too long are actually linked to higher mortality rates. The study, conducted by researchers from the University of Sydney and published in the journal PLOS Medicine, found that a person who sleeps too much (more than nine hours a day), sits too much (more than seven hours a day), and isn’t physically active enough (less than 150 minutes a week) is four times more likely to die early than a person with healthier lifestyle habits. “Evidence has increased in recent years to show that too much sitting is bad for you and there is growing understanding about the impact of sleep on our health but this is the first study to look at how those things might act together,” lead author Dr. Melody Ding said in a press release. She added that when a lack of exercise is added to the mix, a “triple whammy” effect occurs. One of the authors of the paper, associate professor Emmanuel Stamatakis from the Charles Perkins Centre, told Fairfax media that one of the explanations could be that a person’s longer sleeping times might actually be a sign of a more serious health problem. “One of the possible explanations is 'reverse causality'. Long sleeping times could be indicative of an underlying, undiagnosed disease,” he said. However, he added that another explanation is even more likely. “This says nothing about the quality of the sleep,” Stamatakis said. “So, reported long sleep duration could in fact be indicative of fragmented, restless and poor-quality sleep,” he added, noting that this could actually be what is connected to increased mortality rates. The study also examined other behaviors which are already known to increase the risk of death and disease – smoking, high alcohol intake, poor diet, and being physically active – and added excess sitting and too much/too little sleep into the equation. It then looked at different combinations of the risk factors to see which had the most impact on premature death. “Combinations involving physical inactivity, sedentary behaviour and/or long sleep duration and combinations involving smoking and high alcohol consumption were most strongly associated with all-cause mortality,” the study authors wrote. The study, which followed 230,000 people aged 45 and older over a six-year period from 2006, found that one-third of all deaths during the period were caused by unhealthy factors tracked by the study. Those who engaged in all six risky behaviors were five times more likely to die during the study than the reference group of people who didn’t smoke, ate well, exercised, slept well, and kept active. However, Stamatakis admitted the study didn’t take into effect “social desirability bias,” when respondents over-report positive social behaviors and under-report socially negative behaviors. The research is part of the Sax Institute’s ‘45 and Up’ Study, which is aimed at examining the health of the population as they age. The study is one of the largest ever undertaken, covering 11 percent of the target population of New South Wales.